Exiled Saudi dissident Osama bin Laden is seen in this picture in Afghanistan. While bin Laden, the West's chief suspect for Tuesday's slaughter, likely remains confined to a network of camps and caves in eastern Afghanistan, tracking him consistently has proven extraordinarily difficult for U.S. intelligence agencies. DUBAI, United Arab Emirates - Osama bin Laden, the prime suspect in last week's terror attacks on the United States, issued a statement yesterday denying that he was behind the events. "I stress that I have not carried out this act, which appears to have been carried out by individuals with their own motivation," said the statement, broadcast by Qatar's Al-Jazeera satellite channel. In the statement, read out by an Al-Jazeera announcer, bin Laden said he was used to the United States accusing him every time "its many enemies strike at it." Bin Laden, a Saudi exile who has lived in Afghanistan since 1996, has said on at least one other occasion that he wasn't behind the attacks. Jamal Ismail, a Palestinian journalist, has said a bin Laden aide called him after Tuesday's attack to say bin Laden denied being involved but "thanked almighty Allah and bowed before him when he heard this news." 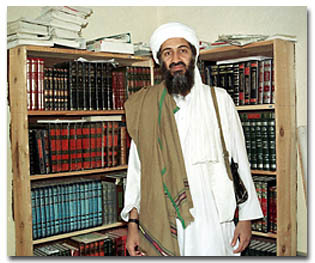 Bin Laden has often granted interviews to Al-Jazeera, known in the Arab world for its wide reach and its independent and aggressive editorial policies. He also gives Al-Jazeera videos when he has a message to relay to the world, such as a tape early this year in which he was shown reciting an ode to Jerusalem and decrying Israel's presence in the city, which is holy to Jews, Christians and Muslims. In yesterday's statement, which was signed "Sheik Osama bin Laden," bin Laden said that he had pledged to the leader of Afghanistan, Mullah Mohammed Omar, to abide by the country's laws, and Omar "doesn't allow those types of acts." President Bush has said that bin Laden is the prime suspect in the attacks in which hijackers battered passenger planes into the two towers of New York's World Trade Center and a side of the Pentagon. A fourth hijacked plane crashed into the ground in Pennsylvania. Bin Laden has been indicted by the United States for the 1998 bombings of the U.S. embassies in Kenya and Tanzania. Days after the bombings, the United States fired dozens of Tomahawk cruise missiles on eastern Afghanistan in an attempt to kill him. Meanwhile, newspapers in Pakistan reported receiving an e-mail from a man purporting to be bin Laden. The message railed against the United States and said killing Americans and "their allies, civilian and military" was the duty of every Muslim. There was no way to prove the e-mail came from bin Laden. The Taliban deny bin Laden has access to any communications.